This is the continuation on an on-going blog lesson. You can see the previous lessons by visiting my most recent posts. 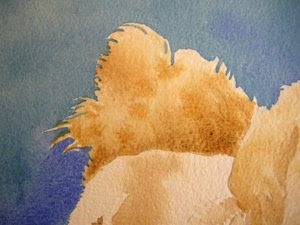 Now it is time to work around the dog's bodies and develop the over-all color and values. This is done very wet-in-wet. I applied water, then dripped pigment into the relative areas where the lights and shadows were represented in the reference photos and my drawing. I want these edges to be very soft. I will work in details later, but these foundational glazes are very important to the over-all impression of shapes in the painting. I applied a very wet mixture of New Gamboge, Quin. Gold and Burnt Sienna to Riley's body, leaving a few areas of white paper where the values were the lightest.